I never thought I'd live somewhere with a climate so mild that there'd be bananas growing in my neighborhood. But this banana tree is just a block away. 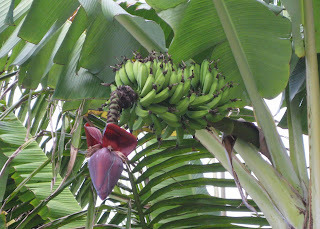 Although the taste and smell of bananas are completely nauseating to me (the reason I call them "Satan Fruit"), I enjoy living in an area with such interesting plants.